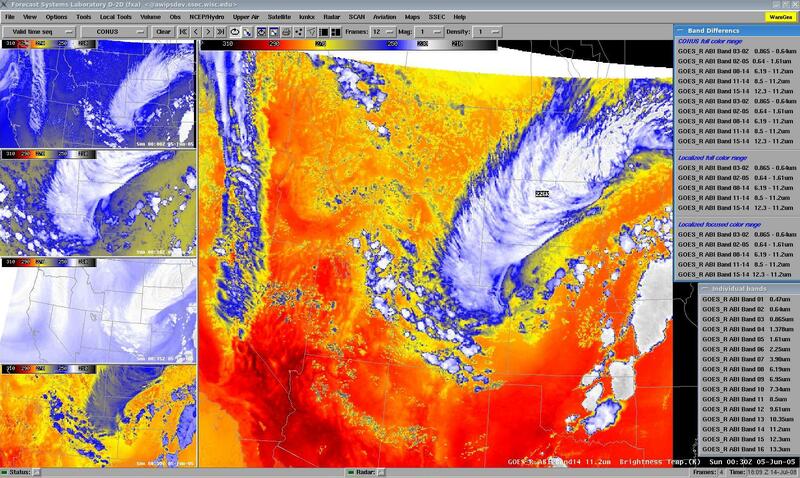 NOAA’s Cooperative Institute for Meteorological Satellite Studies (CIMSS) is engaging in activities that serve as a “Satellite Proving Ground” for new satellite products that are not yet operationally available in the National Weather Service (NWS) Advanced Weather Information Processing System (AWIPS) environment (see the CIMSS Satellite Blog post “2 years of MODIS in AWIPS“). This work allows interested NWS forecast offices to become involved in the early evaluation of these new satellite products by adding them to their local AWIPS workstations via Unidata Local Data Manager (LDM) subscription. Having an active AWIPS satellite proving ground is an essential component of GOES-R and NPOESS (now JPSS) “risk reduction”, which will help to ensure that users are ready for the new types of satellite imagery and products that will be available in the upcoming GOES-R / JPSS era (the GOES-R satellite is scheduled to launch in 2015, the first NPOESS Preparatory Project (NPP) satellite is scheduled to launch in 2011, and the first JPSS satellite is scheduled to be launched in 2015). has been made available for deployment in AWIPS since June 2006. MODIS data is ingested by the SSEC Direct Broadcast ground station at the University of Wisconsin – Madison (with ancillary and/or backup sites being Oregon State University and the NASA Goddard DAAC), re-mapped and re-formatted for AWIPS, and then injected into the Unidata Local Data Manager (LDM) to allow individual NWS forecast offices to add these MODIS products to their local AWIPS. Examples of some of these MODIS products are shown below. A comparison of the MODIS sea surface temperature product from 18 and 19 September 2007 (below) revealed a narrow ribbon of cooler water temperatures (cyan to blue enhancement) that had formed along parts of the western near-shore waters of Lake Michigan (due to upwelling in the wake of a strong cold frontal passage on 19 September). These colder offshore waters later played a role in maintaining fog/stratus along the Wisconsin coast of Lake Michigan on the following day. A special “MODIS True Color Imagery Viewer” has been developed by CIMSS to allow convenient access to 3-channel “true color” images (created using MODIS channels 1, 3, and 4) within the AWIPS environment — these are the same true color images that have been available for the past several years on the SSEC MODIS Direct Broadcast website. Using this Viewer, a comparison of MODIS true color images centered over southwestern Wisconsin (below) showed the extent of flooding immediately downstream of Lock and Dam #8 and Lock and Dam #9 along the Mississippi River, after that region received record-setting rainfall in mid-late August 2007. AWIPS images of the MODIS visible and 1.6 Âµm â€œsnow/iceâ€ channels from 13 December 2007 (below; closer view) reveal that much of the southeastern half of Iowa received a significant glazing of ice (0.25 to 1.0 inch) during a freezing drizzle/freezing rain event on 10-11 December. Snow and ice particles are very strong absorbers at the 1.6 Âµm wavelength of the MODIS snow/ice channel, so the thick coating of ice (on top of pre-existing snow cover) shows up as a very dark feature on those images (even darker than adjacent areas to the north which had more snow cover but did not receive significant amounts of freezing rain). In contrast, supercooled water droplet clouds show up as much brighter features on the MODIS snow/ice channel image. Two new MODIS products (that were added in November 2007) are the Normalized Difference Vegetation Index (NDVI) and the Land Surface Temperature (LST). An example of these two products shows the Mississippi River Alluvial Valley (MAV) on 12 May 2008 (below). The MAV shows up as a lighter shade of gray on the visible image, with significantly lower NDVI values around 0.2 to 0.3 (lighter green colors). In addition, significantly warmer LST values were seen in the MAV, being 20Âº-30Âº F warmer (darker red colors) compared to the surrounding forested areas (similar warm LST values were also noted over cities and other heavily urbanized locations). The NDVI and LST products may provide some value for forecasting tasks involving fire weather, hydrology, fog and/or cumulus cloud field formation, and maximum/minimum temperature forecasting. GOES sounder derived product imagery of Convective Available Potential Energy (CAPE) from 28 August 2007 (above) showed strong instability (denoted by the red to violet colors) along and ahead of an advancing cold frontal boundary — the severe thunderstorms that later developed along the front produced large hail and damaging winds. This sounder CAPE product compliments the sounder Lifted Index (LI) product that is currently available operationally in AWIPS; the CAPE product can be used to diagnose areas of convective instability that might not be as well-defined using the more basic LI algorithm. GOES sounder total column ozone from 23 March 2007 (below) demonstrated the utility of this product for model verification purposes — regions of high ozone are often co-located with high values of potential vorticity (potential vorticity anomalies due to a lowering of the dynamic tropopause) in the vicinity of strong upper level troughs and cut-off lows. Elevated ozone values are also often present along the axes of well-defined jet streaks. A comparison of the experimental GOES “mesoscale winds” during the period from 12:46-14:16 UTC on 04 October 2007 (above) and the corresponding operational GOES “high density winds” that were available in AWIPS during that same 90-minute time period (below) showed a notable improvement in satellite-derived atmospheric motion vector coverage (both spatially and temporally) using the CIMSS mesoscale winds. The CRAS forecast satellite images have also been well-received so far, appearing in a number of Area Forecast Discussions issued by the National Weather Service forecast office at Milwaukee/Sullivan, Wisconsin. Simulated images for all 16 of the GOES-R ABI channels are shown for Hurricane Katrina on 28 August 2005 (above). This simulation was performed using computing facilities at the National Center for Supercomputing Applications (NCSA) at the University of Illinois at Urbana-Champaign. Simulated atmospheric fields were generated using version 2.2 of the WRF model (ARW core). The simulation was initialized at 18 UTC on 28 August 2005 with 1Â° GFS data and then run for 48 hours on a double-nested domain containing 4.5-km and 1.5-km horizontal grid spacing, respectively. Sub-grid scale processes were parameterized using the Thompson et al. (2008) mixed-phase cloud microphysics scheme, the Mellor-Yamada-Janjic planetary boundary layer scheme (Mellor and Yamada 1982), and the Dudhia (1989) shortwave and Rapid Radiative Transfer Model longwave (Mlawer et al. 1997) radiation schemes. The CIMSS forward radiative transfer modeling system was then used to compute simulated radiances for each GOES-R Advanced Baseline Imager (ABI) spectral band. The Successive Order of Interaction (SOI) model was used as the radiative transfer solver. The system contains separate modules for the solar (1-7) and infrared (8-16) bands. The infrared module computes gas optical depths using Compact OPTRAN in the CRTM, while the solar module uses a band model lookup table. Both modules compute cloud optical properties using lookup tables based on exact solutions. Surface properties are taken from the CIMSS land surface IR emissivity product and the InfraRed Sea Surface Emissivity Model (IRSSEM) for the infrared module, whereas MODIS land surface albedo products and an ocean surface reflectance model are used for the solar module. Simulated GOES-R ABI imagery in an AWIPS format (below) is also being generated, to begin assembing Weather Event Simulator (WES) training material to prepare forecasters for the type of satellite imagery that will be available with GOES-R.
A demonstration of what we hope will eventually be an RGB image display capability in AWIPS-2 is shown owith the MODIS false-color image below. The pink-colored feature is a broad swath of snow and ice on the ground across much of Oklahoma on 30 January 2009. A deck of supercooled water droplet clouds can be seen in the upper right corner of the image; bare ground shows up as varying shades of green. 1-km resolution POES AVHRR visible and 10.8 Âµm IR images over the Kansas City area, showing the development of mesoscale areas of intense convective snowfall that caused a number of traffic accidents. A comparison of the 4-km resolution GOES-12 fog/stratus product with the corresponding 1-km resolution POES AVHRR fog/stratus product over eastern Wisconsin and Lake Michigan. A comparison of 1-km resolution POES AVHRR 3.7 Âµm IR, 10.8 Âµm IR, and fog/stratus products which reveal the presence of power plant plumes spreading southeastward from Lower Michigan. A comparison of 1-km resolution POES AVHRR Cloud Type, Cloud Top Temperature, Cloud Top Height, Cloud Optical Depth, and Cloud Particle Effective Radius products for a cut-off low centered over Missouri and Arkansas. An animation of 1-km resolution POES AVHRR Cloud Type product, showing a number of ship tracks trailing behind a cold front that was moving eastward over the western Atlantic Ocean. A comparison of 1-km resolution POES AVHRR Cloud Top Temperature and Cloud Top Height products showing the formation of wave clouds in the vicinity of Baja California. An animation of POES AVHRR Cloud Type product, showing the formation of a cirrus banner cloud due to strong northerly flow over the Brooks Range in northern Alaska. 1-km resolution AVHRR Sea Surface Temperature product showing that the oil slick from the Deepwater Horizon oil rig collapse was exhibiting SST values that were several degrees cooler (green color enhancement) than the surrounding waters in the northern Gulf of Mexico. An animation of GOES-derived Convective Initiation, Cloud Top Cooling Rate, and Overshooting Top products that are being generated in support of the Storm Prediction Center Hazardous Weather Testbed. A poster “MODIS Products in AWIPS: Using Research Satellite in Operations” was presented at the National Weather Association 2008 Annual Meeting at Lousiville, KY, which showed examples of MODIS imagery similar to those seen on this page. CIMSS and SSEC staff involved in the “CIMSS Satellite Proving Ground” activities include Bob Aune, Scott Bachmeier, Kaba Bah, Kris Bedka, Russ Dengel, Wayne Feltz, Jordan Gerth, Scott Lindstrom, Jerrold Robaidek, Tim Schmit, Kathy Strabala, Gary Wade, and Steve Wanzong.